It would be easy to center a story on Suzie Parker Nichols, BS Ed ’68, a singer who while traveling in 1985 saw a choir dressed in Victorian-era clothes, returned to mid-Missouri, recruited other Mizzou alumni and founded her own costumed a capella group — a group that has since caroled every Christmas season to raise $82,000 for music scholarships at MU. 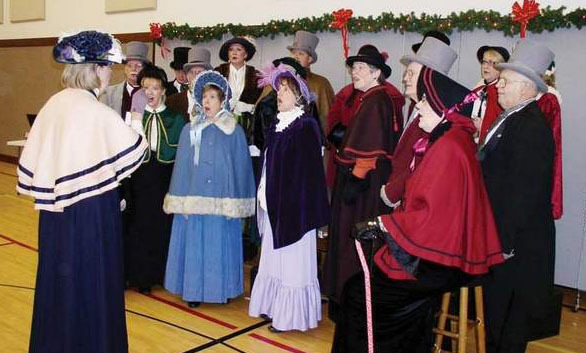 Suzie Nichols directs the Missourians in performance at Boonville's First Baptist Church, December 8, 2013. The First Baptist Church in Boonville hosted The Missourians Sunday evening at their annual Thanksgiving/Christmas dinner. Despite low temperatures, snow covered roads, and an earlier performance in Tipton, the group delivered an impressive acappella concert. Directed by Suzie Nichols, founder and music arranger, they sang traditional Christmas songs like Joy to the World and children’s pieces like Santa Claus is Comin’ to Town. The Missourians held the audience spellbound from start to finish. Midway through the concert, Nichols told the audience, “Sometimes we like to mix it up a bit and use instruments.” The next number was accompanied by two small bells that added just the right touch to an already beautiful song. Although all the songs were old and well-known, the arrangements were new and different and added a fresh take on traditional favorites. The Missourians are part of the University of Missouri and their members are from all over Missouri. They travel the state and their concerts raise money for music students at the university. According to Nichols, the group has been singing for 26 years and has raised over $70,000. First Baptist Church contributed to that impressive amount by taking a good-will offering at the end of the performance. More information about The Missourians or to schedule them for an event can be obtained by emailing Nichols at suzdeblonde@yahoo.com.